(CNN) - Rick Perry says that if he's elected president, he'll end what he calls President Barack Obama's "war on religion." 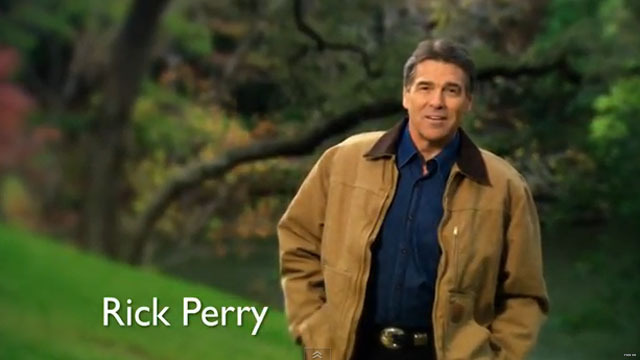 Perry makes the comments in a new TV commercial that's sure to create controversy. "I'm not ashamed to admit that I'm a Christian, but you don't need to be in the pew every Sunday to know there's something wrong in this country when gays can serve openly in the military but our kids can't openly celebrate Christmas or pray in school," says the Texas governor and Republican White House candidate. "As President, I'll end Obama's war on religion. And I'll fight against liberal attacks on our religious heritage. Faith made America strong. It can make her strong again." The Perry campaign tells CNN the 30-second spot starts running in "heavy rotation" statewide in Iowa Wednesday. The state's Jan. 3 caucuses kick off the presidential primary and caucus calendar. The campaign says the ad will also run on cable television on the Fox News Channel. The 30-second spot is slotted to run statewide starting Wednesday in Iowa. The state's Jan. 3 caucuses kick off the presidential primary and caucus calendar. In an email release touting the new commercial, the Perry campaign lists headlines from mainstream, conservative, and religious reporting sites to illustrate what it calls the "Obama Administration's war on religion." Those examples include the president's move to stop defending the 1996 Defense of Marriage Act and his exclusion of the word "God" from his Thanksgiving speech. In an interview Wednesday with CNN's Wolf Blitzer, Perry said he stood by the ad. "The administration is clearly sending messages to people of faith, and organizations of faith, that we're not going to support you with federal dollars," Perry said. "I'm very comfortable with that ad, for one thing. My faith is a part of me, and the values I learned in my Christian upbringing will affect my governing." CNN has reached out to Obama's re-election team for reaction to the new Perry ad. Perry is a Methodist and has not shied away from touting his faith during his presidential bid . In an earlier campaign commercial, Perry described himself as a "man of faith." Social conservative voters are influential in race for the GOP presidential nomination, especially in Iowa and South Carolina, the first southern state to vote. So what about all the people out there who stand for gay rights and don't want religion to mix with school and politics Lots of you out there. Stand up and make your voice heard! I respectfully suggest that Mr. Perry go home and be quiet. This is the only possible way he can stop proving that he is ignorant on virtually every topic he chooses to address. Christianity destroyed the Roman Empire. Christianity will destroy the United States Empire. We Americans seem to be declaring war on everything these days: the war on religion, the culture war, the war on Christmas, the war on the middle class, the war on terror, the war on drugs, the war on volcanoes. A war is a declaration of open armed conflict between two nation states, in which one tries to destroy or overpower the other. Ironically, we haven't declared an official war since WWII: we called the Vietnam War a 'police action.' What's going on with language in this country? Can't we just call a spade a spade anymore? It's a war on religion...and we start bombing at 2pm. Sounds like a Reagan line.